Jet Melencio’s works from the 90s bring us back to a time when painting was an oscillating field, wavering between promise and the weight of tradition, propaganda and other stockpile ideologies. The last decade of the 20th century was a period of retrenchment and rethinking not just in the arts, but also across all aspects of life. In Roberto Chabet’s class at the University of the Philippines, painting became the subject of intense interrogation, an arena in which both its failures and possibilities were acutely examined. Through Chabet’s method of deconstructing and reconstructing images via the series of 100 Drawings, he instilled in his students an awareness of painting not merely as a reflection or an expression, but as a process of existential reckoning. In Jet’s case, these serial exercises initially served as a form of visual diary, wherein he could unload and wrestle with the thoughts of the day. As they accumulated they acquired an impetus of their own, becoming an outlet for further experiments with surface, color, texture, objects, materials, and processes, such as encaustic, which was hardly done at that time. The use of hot wax in the encaustic process can already be seen as an interesting allegorical amber that entraps painting itself. In Poppy Field (1995), he assembled a large triptych of black, yellow and dark pink encaustic panels incised by a slightly quivering red neon light originally patterned after a hand drawn line. The painting was based on drawings using ballpen, crayons and oil pastel on ordinary colored paper. Part of the Measure and Metaphor exhibition curated by Chabet at The Art Center in SM Megamall, the painting is named after his psychedelic punk band and can be likened to a hallucinogenic landscape, with its rippling, impressionistic marks that expand and tremble across the surface of the three panels. 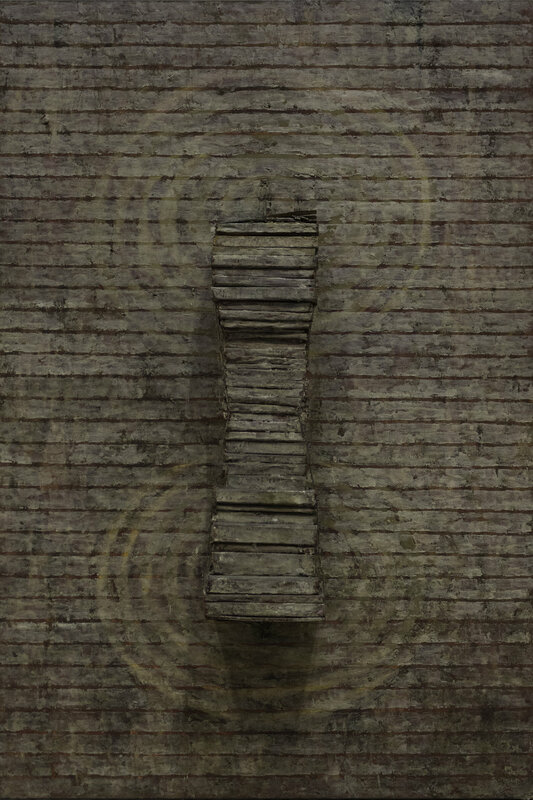 Marks on preparatory drawings are sometimes translated into actual objects as in Head to Wall (1995/2004), wherein he attached a stack of books in the center of a single encaustic panel as an attempt at a more defined iconography. First shown as part of the Painting By Numbers exhibition curated by Chabet at the Cultural Center of the Philippines in 1995, the work is based on a drawing of thickly applied red and tan enamel paint on paper. The blown up painting lures the viewer in through the central relief of books and the concentric circles radiating from each end, creating a labyrinthine inscription from which the viewer cannot escape. He describes it “like the force fields on opposite ends of a magnet, or a bridge between portals leading out of a plane. It is a body with strong opposing forces in stasis, immobilized, with no definite direction.” Nearly ten years after it was created, he returned to the work for his solo exhibition Sleep at West Gallery in 2004, painting it over with white bands as a way of reclaiming it from the aggression of the original image. Like many of Chabet’s students, Jet also used found images, apart from his own drawings, as a basis for his paintings. Placebo (1996) is a two-panelled work based on a photograph from Architectural Digest magazine, which was included in the Dangerous Metaphors exhibition also curated by Chabet at The Art Center in SM Megamall in 1996. Jet recalls looking at the black and white images of formally decorated houses, thinking they were devoid of warmth and human presence. He painted over the page, creating a pattern of vertical forms in navy and red, each anchored to a common point with gauzy, faint tendrils, which became the basis for one of the panels of the diptych. He added a second panel (now lost) in chalky grey blue acrylic, a color, which he believed emanated the placebo effect of the ‘safe houses’, and extended the work into real space by attaching strips of lace pinned onto an armchair facing the canvas. 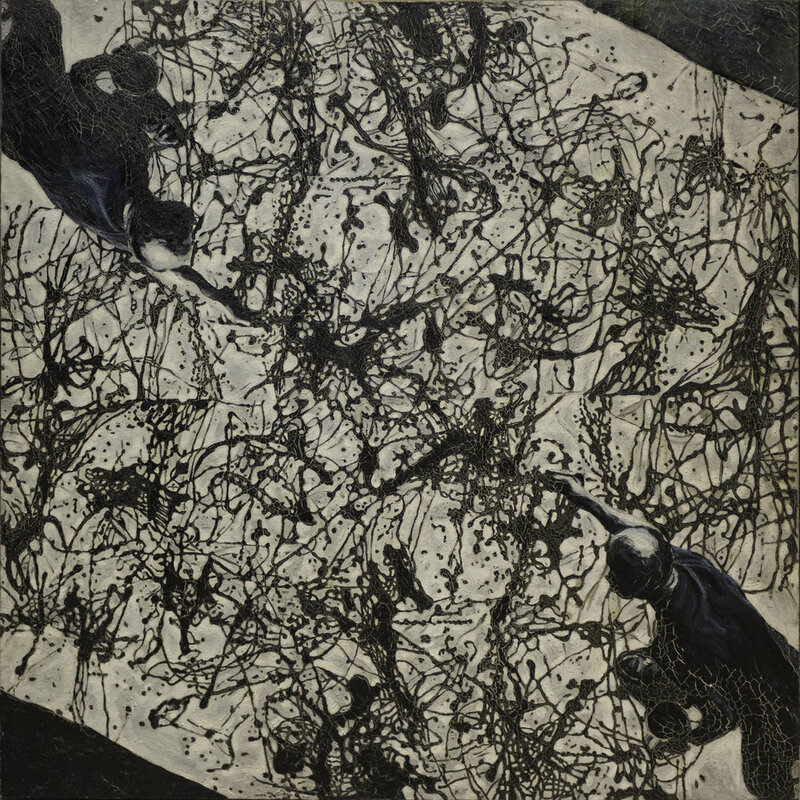 One of his earliest surviving works Arena (1991) is also based on a suite of photographs of Jackson Pollock painting taken by Martha Holmes for Life magazine in 1949. Using found images of art was a way for him to observe and comment on art history. By copying the photograph grid-by-grid, he explained that he “mirrored the artist in the act of painting so that he appears to be in battle with his own image. Copying the splatters meticulously contradicts the visceral spontaneity of action painting, transforming it into a cerebral and deliberate image-making.” Originally exhibited as a floor piece for the Figures of Speech group exhibition at Alliance Française in 1991, the work continues to mesmerize with its web of fine lines, which is accentuated even further with the tangle of cracks that have erupted on its surface. Jet Melencio studied Painting at the University of the Philippines College of Fine Arts in Diliman in the early 1990s. His first solo exhibition The Hot Gates was held at West Gallery in 1991. He also participated in several landmark exhibitions curated by Roberto Chabet at the Cultural Center of the Philippines, The Art Center in SM Megamall, and other galleries and alternative spaces in Manila. His body of works encompasses a broad range of media and disciplines, including painting, sound, video, installation, participatory projects, theater, and design. He also worked as a curator for the Ayala Museum and was a key artist in Big Sky Mind, where he initiated sound art projects and collaborations between artists and musicians. Currently based in Toronto, Canada, he was recently included in the first Manila Biennale: Open City in Intramuros in 2018, where he presented a video installation and a military haircut performance on the Biennale’s opening night.